An extremely deep multi-band optical image from the Canada-France-Hawaii Telescope (CFHT, Hawaii. 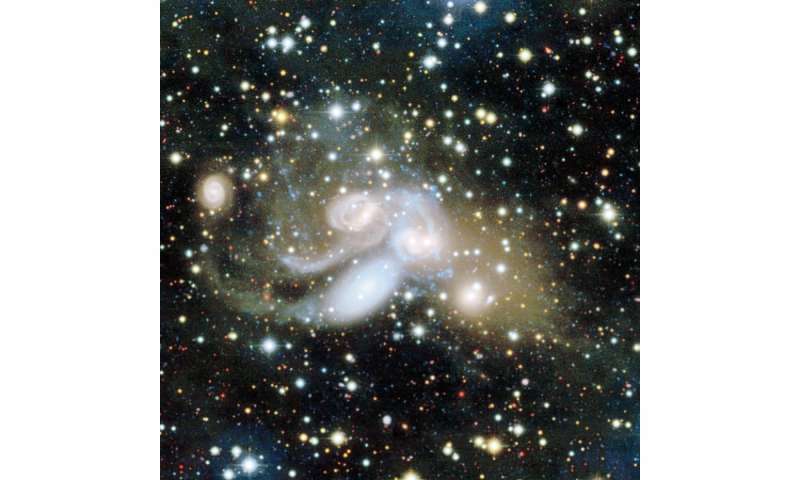 USA) casts a new light on the formation process of the famous group of 5 colliding galaxies. The image reveals structures undetected thus far, in particular a very extended red halo composed of old stars, and centered on an elliptical galaxy, NGC 7317, which had been ignored in previous studies on the dynamics of the global collision. These results are published in the Monthly notices of the Royal Astronomical Society by a team from the Observatoire Astronomique de Strasbourg (France), CEA Saclay (France) and the Lund Observatory (Sweden). The wide field image captured with the 380 megapixel camera called MegaCam is focused on the nearby galaxy NGC 7331. 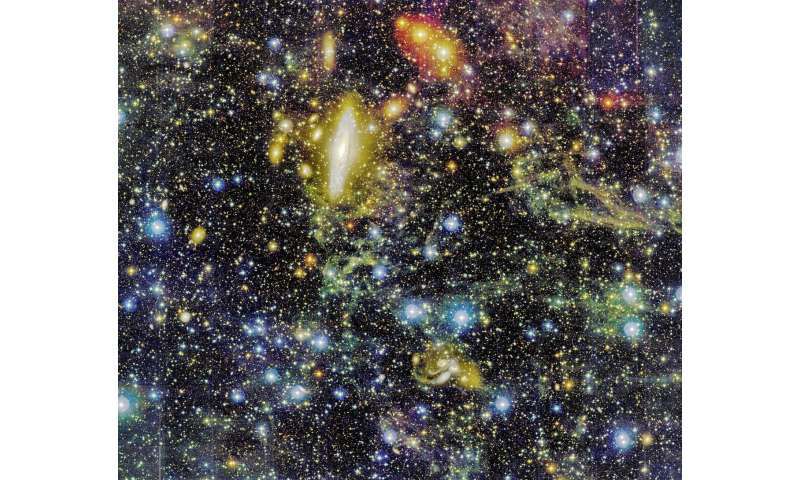 The image exhibits several galactic and extragalactic features, some very extended and dim, including filaments of interstellar dust in the foreground (galactic cirrus). The scientists' attention was however captured by the condensation of galaxies in the field, much further beyond NGC 7331: the famous Stephan's Quintet named after the French astronomer Édouard Stephan who was the first to observe it in 1878. Stephan's Quintet is a compact group of 5 spiral and elliptical galaxies (excluding a spiral in appearance related to the system but actually present in the foreground, at the same distance as NGC 7331). The Hubble Space Telescope immortalized this region after observations of the group became one of the telescope's iconic images. Stephan's Quintet is the poster child for studies on the collective evolution of galaxies subjected to a range of effects such as interactions and slow collisions creating gravitational stellar streams, high speed galactic collision, gas ramming, starbursts and creation of intergalactic stellar systems. Due to its unique features, Stephan's Quintet has been widely observed across the entire electromagnetic spectrum, and has been the subject of many complex numerical simulations. The team detected a red halo composed of old stars centered on a galaxy, NGC 7317. NGC 7317 was thought to be in a stable state or recently arrived near the group. The detection of red stars implies the contrary, that this galaxy has been interacting for a very long time with the other members of the group. Interactions such as the one seen in these observations are called galactic cannibalism. Galactic cannibalism occurs when the gravitational forces from a larger galaxy or group of galaxies slowly tear apart a smaller galaxy. Characteristic features of galactic cannibalism are streams or halos of stars orbiting the larger galaxy, like the halo of red stars seen around NGC 7317. A first implication is that Stephan's Quintet is far older than currently admitted. The models of formation and evolution of this emblematic system will have to be revised. This global case of galactic cannibalism should eventually lead to the formation of a giant elliptical galaxy. This new result illustrates the current renewed interest in the scientific field for deep imaging on nearby galaxies. Many observing programs, including several developed at CFHT which is particularly well suited for such studies, aim at decoding the past history of galaxies through the detection in their direct environment of faint extended features, a technique known as galactic archeology. Each year since 2000, CFHT produces in collaboration with the Italian editor Coelum the Hawaiian Starlight calendar based on beautiful images of the sky captured by MegaCam. These images result from special observations obtained through CFHT director's discretionary time when atmospheric conditions, in particular the stability of the atmosphere, are not suitable for regular observations. Some of these images sometimes turn out to be of great scientific interest: such is the case here for Stephan's Quintet.